As part of its recent ATC upgrade Blackpool Airport has recently upgraded its weather monitoring equipment and installed a Campbell Scientific CS135 ceilometer as part of a precision approach system approved by the CAA. 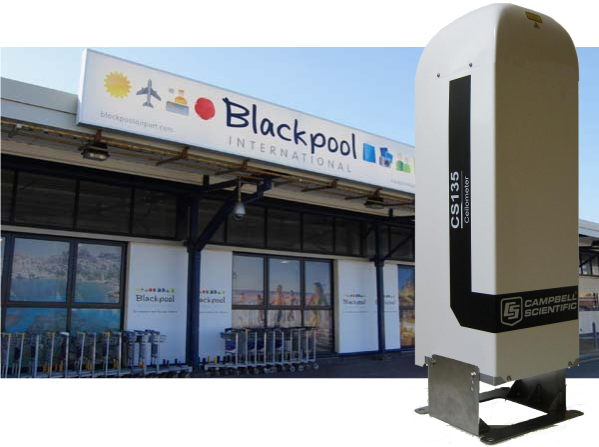 The CS135 was carefully chosen by Blackpool airport and due to its importance a very thorough process of test and evaluation carried out to ensure its suitability. The CS135 is a very reliable instrument with a high mean time between failure and exceptional laser lifetime. It provides cloud heights and cloud layer information to standards in excess of ICAO and CAA standards. In addition it offers high performance for all applications with a maximum range of 10km, and internal mixing layer height algorithm for air pollution studies and full aerosol scatter profiles for atmospheric research. Blackpool Airport is a valuable asset for the North West Region of the UK. It is the base for the main air link between the Isle of Man and the UK mainland and supports a wide range of business aviation. Blackpool Airport also plays a crucial part in hosting the helicopters that support the Morecambe Bay and Liverpool Bay Gas fields. The local air ambulance service also operates from Blackpool Airport. All these specialist helicopters depend on weather information to allow operations to continue with minimal interruption.